Your dog doesn't have to be from the old country to enjoy an old favourite. With wavy pasta pieces and meaty chunks this scrumptious entrée might make your dog bark something in Italian. 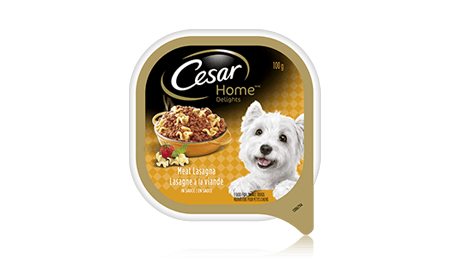 CESAR® HOME DELIGHTS® MEAT LASAGNA IN SAUCE 100g is rated 5.0 out of 5 by 1. Rated 5 out of 5 by Sassie from Loves This One Sassie loves this flavour the most!!! We add some to her dry food and she gobbles it all up! CESAR® HOME DELIGHTSTM Meat Lasagna in Sauce is formulated to meet the Nutritional levels established by the AAFCO Dog Food Nutrient Profiles for maintenance. CHICKEN, BEEF, LIVER, PASTA, MEAT BY-PRODUCT, STARCH, WHEAT GLUTEN, MINERALS, PEA FIBRE, SALT, WHEAT FLOUR, SODIUM TRIPOLYPHOSPHATE, TOMATO POWDER, BASIL LEAF, VITAMINS, CHEESE, COLOUR, OREGANO POWDER, NATURAL FLAVOUR, XANTHAN GUM, GUAR GUM, SUFFICIENT WATER FOR PROCESSING.